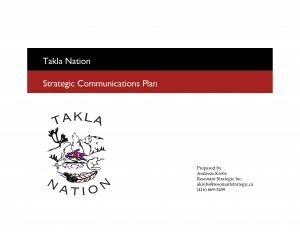 Through a series of interactive scoping exercises, Resonant Strategic identified current communications problems faced by Takla Nation, developed communications goals for the Nation, identified their audiences, wrote key messages, and developed a workplan to achieve those goals. Now that the plan is finalized, Resonant Strategic has been working with Takla’s communications staff to improve their skills. We set up their social media channels, and trained them in content production and how to check their progress. We developed their brand guidelines and all associated collateral including letterheads, report templates, powerpoints, and a standardized set of messages to be used in presentations and proposals. We redesigned their website to make it accessible to members. Through our mentorship and consulting, Takla Nation is now effectively reaching their most important audiences — membership, industry, and other levels of government — and achieving their strategic goals.